This 3-in-1 exfoliating scrub, muscle soak and body moisturizer smooths skin, soothes tired muscles and helps relieve tension. Perfect for use after working out or playing sports, this Eucalyptus-infused scrub gently warms as you rub, to loosen knots. 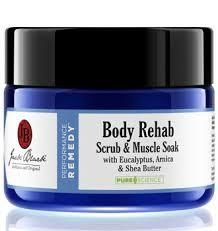 Arnica and Sea & Epsom Salts relieve tension and soothe tired muscles.